Home>Plan Your Trip>Gauthier & Spaulding Fisheries Inc.
It’s been more than a hundred years since John Gauthier’s ancestors began fishing in the Great Lakes near Two Rivers, Wisconsin. He was about 10 years old when he started working gill tugs with his family near Fairport on the Garden Peninsula in northern Lake Michigan. He remembers how sick he used to get on rough days, but he kept at it. He met Tom Spaulding in high school; the two became best friends, and John taught Tom to fish. They tried to start their fishing business in 1984, when they got a license to fish around Whitefish Point on Lake Superior. However, it wasn’t exactly smooth sailing. In less than a year, they had to move south to Lake Huron because a consent decree with federally recognized Native American tribes re-assigned their fishing area. They settled in at Rogers City and built a state of the art processing facility—complete with walk in freezer and filleting machine—to complement their sturdy trap net boats. However, in 2000, the partners had to move their boats and nets farther south—past the 45th parallel—in response to a renegotiated settlement with the Indian tribes. 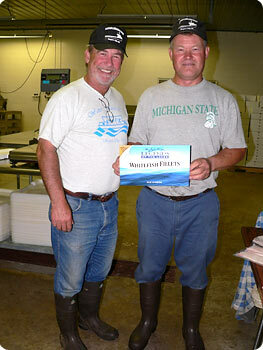 The processing plant and its retail counter serving fresh and smoked fish remains in Rogers City. Gauthier says fishing is ‘in his blood,’ “The Lord wanted me to fish, and I can’t imagine doing anything else.” So fish he has—for about 40 years now—23 of them from the northeastern Michigan base. Over the years, he and Tom have seen lots of changes in gear and technology and in the lakes themselves. They’re very concerned about the effects that aquatic invasive species are having on the ecology of the lakes in general and the fishery in particular. We also carry a large selection of seafood items and are a dealer and producer of the high quality Legends of the Lakes brand of Whitefish fillets.